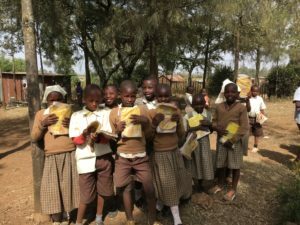 As we drove up the bumpy, long, dusty road towards Piave Primary our voices filled the air with excited chatter about the prospect of finding water. 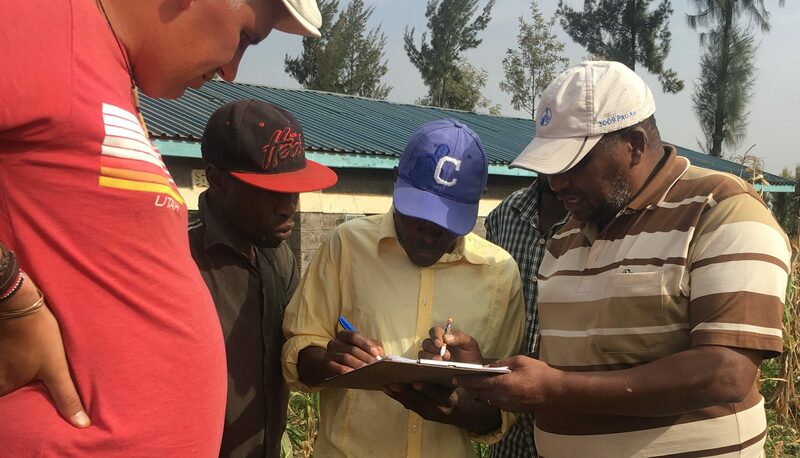 We asked endless questions to the experienced water surveyor and his team we had hired to do the job. We were told they would do some traditional surveys prior to utilizing the up to date technology they had to find water. As the car pulled up to the school, hundreds of children were waiting at the gate anticipating our arrival. They greeted us with smiles and eagerness to see the “water man” work his magic and hopefully bring good news. The thought of not having to walk 2.5 miles (4km) to the river and collect dirty drinking water to carry back to school was exhilarating! This would leave more time for learning and playing as well as take away the issue of diarrhea and other illnesses caused by dirty drinking water. 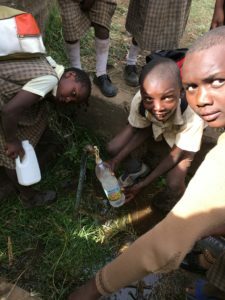 When we asked the students what they thought about having water right at their school they responded in unity – “Maji ni uhai” or “Water is Life”. Water is the most precious resource that I grew up never even thinking about. I didn’t realize all the benefits that water has provided me in my lifetime, some necessary and many just comforts that I sadly realized was not a reality for many parts of the world. I think back to all the fun times I’ve had in the summer swimming or going to the water park and then contemplate all the hot showers, toilets in my home, hand-washing at the sink, water for cooking dinner, brushing my teeth and trying to hit my 64 oz goal of drinking water for the gym and feel a twinge of guilt but then I realize that it’s not any wrongdoing that I have done but simply the widening gap of the rich and the poor in the world. We should not feel guilty for being born into life with a head start but should realize our responsibility to others as humankind and the ability to truly make a difference on an individual level. In the 21 st century we have the resources, the knowledge and the ability to eliminate the issue of access to water and many other poverty related issues. Our surveyor, Simon, first walked around the 4 acre property with two metal poles. For a moment, we wondered did we hire who we thought was the best surveyor in Kenya to simply walk around with two small metal poles and hope we find water?! Simon saw our curious looks and explained that underground water creates a small magnetic force when it is flowing, comparable to static electricity created by walking on a carpet. The metal poles gravitate towards each other when there is flowing water beneath. To our amazement it actually worked! Simon called his team to come test the spot he suspected the greatest amount of water. They spent hours with heavy equipment testing the depth and location of where we would find water!At last they shared the results of the survey and we have found water! Chris broke the ground at the exact location we will have a well in just a few short months and the joyous news spread around the school and the community. Neighbors shouted with joy. Water is coming to their neighborhood! 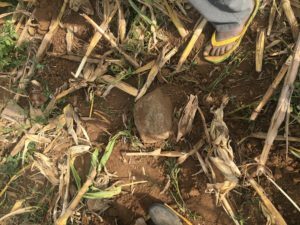 A stone was buried at the location for the drilling team to find when they return. We then loaded up the equipment and headed off to our second location of the day, Kaiyaba Primary School. The children were playing in the field as we arrived during lunch break at the school, although I noted with sadness there were no lunchboxes to be seen except for a small group of girls sitting in the corner under a tree. The smiles and excitement beaming from their faces welcomed our team. 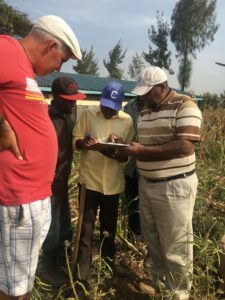 Simon started again with his two metal rods around the 4 acre plot filled with corn. As he weaved through the rows of corn he smiled he had activity underground. He called his team and they quickly got to work measuring, digging, and writing on their notepads. The elders from the village gathered and watched with eager anticipation for the news that water was coming HERE! Again, Simon announced they had found water and we marked the precious location with a stone. The next time we return to the stone will be to dig a lifesaving well for water. We returned to the school and classes were back in full swing, text books were being distributed outside under a tree while students lined up to receive theirs. Curious faces flipping through to see what this year had in store for them. Another group of students were gathering and cutting firewood. Working together to prepare for the time they will have a school lunch program. Word had spread that water is coming to Kaiyaba and they can farm on the school property even in the dry season. The teachers and students eagerly anticipate the days where children will not have to learn on an empty stomach. As we said our goodbyes and packed up the equipment we drove off into the evening sunset dreaming of the day that the rigs will come to the small villages and truly make a difference in the thousands of people that live there. Hundreds of faces and names of people have contributed to making a difference in these children’s and families lives. Today I am grateful.